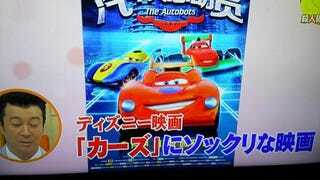 Japanese morning show Sukkiri (via Naver) is reporting that this new made-in-China animated movie features designs that seem to resemble Pixar’s Cars. The show says it could be a rip-off! Oh? The cars do not appear to transform into robots. They do race around the track and have big googly eyes on their windshields just like Pixar’s characters do. The main red racer sure looks like Cars’ Lightning McQueen, while other vehicles resemble other characters, like Sarge and the Italian F1 car Francesco Bernoulli. Some on Twitter are comparing the animation to first gen PlayStation graphics. According to Sukkiri, a spokesperson for The Autobots has denied that it rips off Cars, saying that while they’ve “learned some things from Disney,” this isn’t the same as the Pixar film.